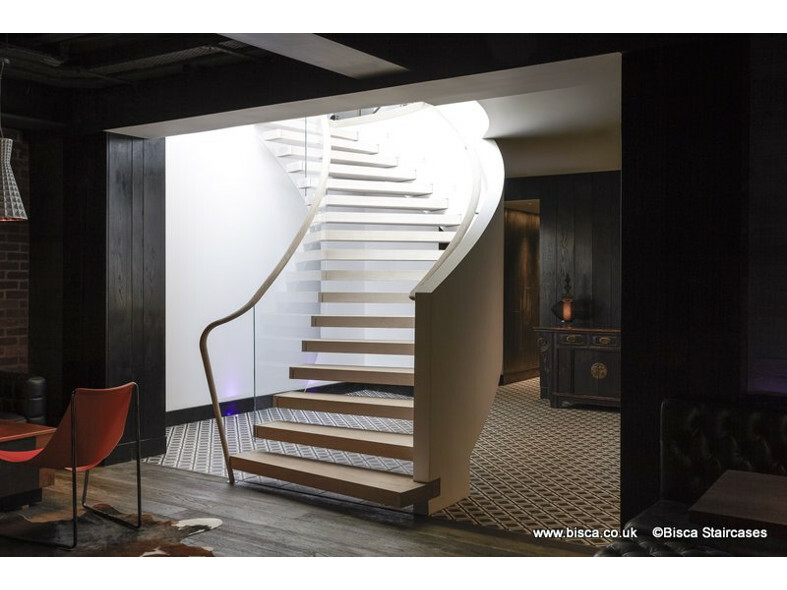 Our clients brief was to design, manufacture and install a feature staircase with ‘wow factor’ from a ground floor living kitchen, down into a multi-sensorial chill out entertainment room in the basement. 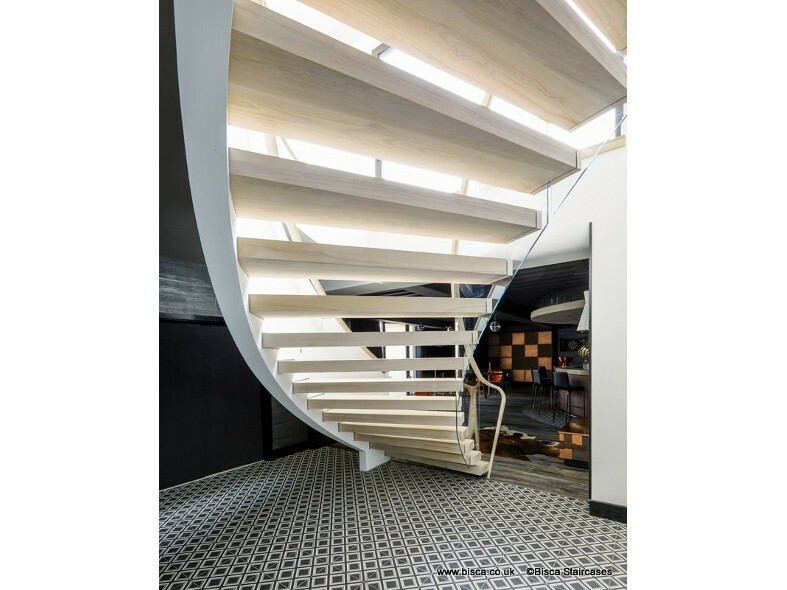 The staircase design had to form an aesthetic and functional link between the individualistic designs of the kitchen and basement. Lighting was an important feature due to the contrast between the kitchen with its bank of floor to ceiling windows and the darkened basement with little natural daylight. Our solution was a helical and cantilevered staircase, sweeping down from the kitchen into the basement. The monolithic structure appears to hang in the space, reflecting the design of the feature fireplace in the kitchen. Generous treads of kiln dried Ash were oiled to match the naturally curved hardwood “Bolefloor” timber in the kitchen; our open tread design allows all available light to flood down into the basement area. 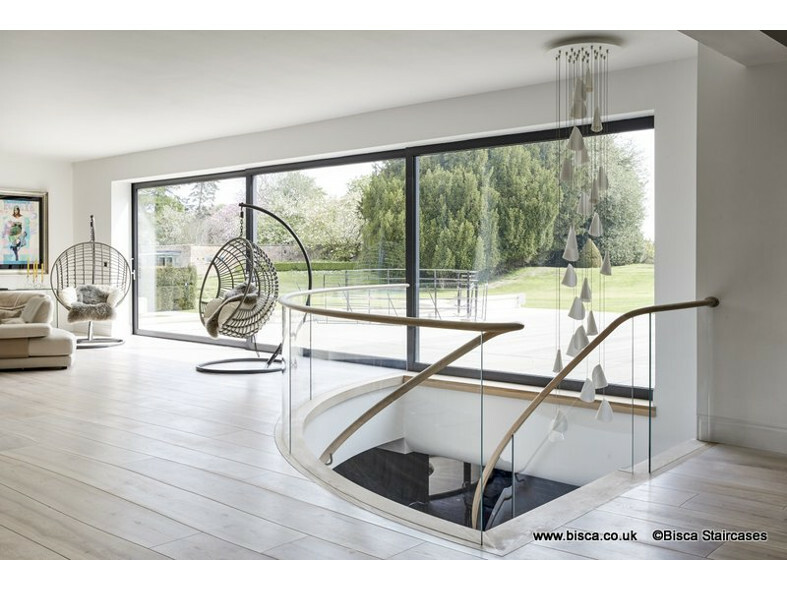 A glass balustrade made from panels of curved, toughened low iron glass guards one side of the stair, whilst the other side features a crisp parapet wall of plastered steel, with light reflective white paint. Our designer and craftsmen continued the grain of the treads “through” the glass balustrade, and tread end caps were fixed to the outer edge of the treads giving the effect of floating and continuous treads. Wide oval section Ash handrails sit both top of the balustrade and run along in the inside of the parapet wall. 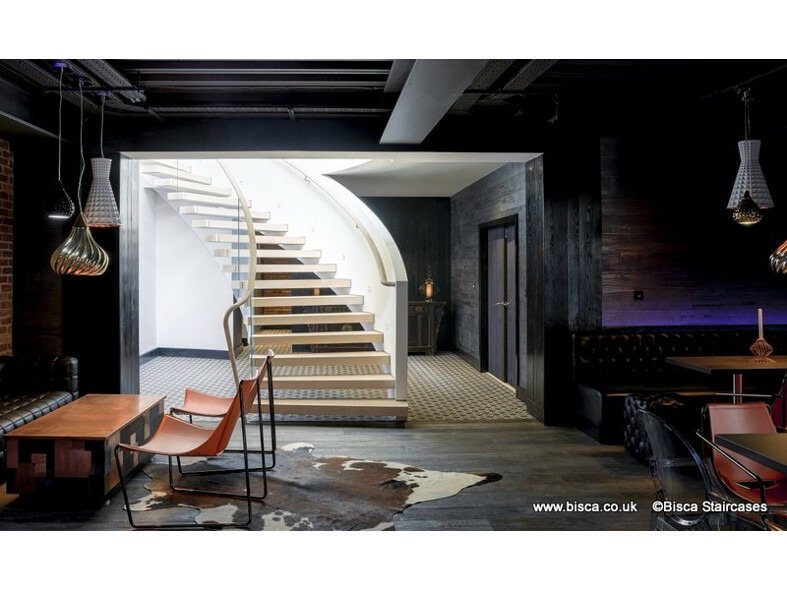 A feature newel in the basement seamlessly connects with the same oval section handrail before flowing up the staircase and around the first floor landing galleries.